Intimidating looking chimneys in a corner, Beulah’s Book doesn’t usually get the credit it deserves. 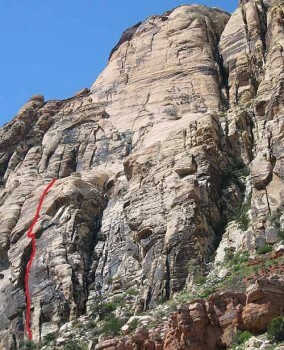 It is one of the finest three-pitch routes of its grade in Red Rocks, and with a wild new arête variation, requires little in the way of chimney skills. The striking upper part of the book above the chimneys has outstanding climbing. Which SuperTopo guidebooks include a topo for Beulah's Book? FA: Randal Grandstaff, Dave Anderson, 1979. While not as popular as Johnny Vegas or Solar Slab Gully, Beulah’s Book still gets lines and so an early start is recommended, especially if you do plan to continue higher. No wide protection is needed for the climb if you use the arête variation on the second pitch; a single 4-inch piece is all that is needed to supplement the rack for the original route.